Zealand Army Corps, or ‘Anzac’, landings at Gallipoli in 1915. The Kokoda Track Memorial Walkway’s publication Gallipoli, Kokoda and 100 Years of Australian Service [PDF 9MB] provides a comprehensive guide to the story and people behind the creation of Meeting The Sun. Teachers are encouraged to read Anzac Notes: Gallipoli, Kokoda and 100 Years of Australian Service to gain an understanding of the context and methodology through which Meeting The Sun was commissioned, created and performed and how this unique project can enhance how the concept of ‘Anzac’ is understood and interpreted through Australian music. support students and educators in their learning and experience of Meeting The Sun.The education kits are structured in accordance with Music Curriculum key learning areas for students in Year 7/8 or Stage 4 (NSW Board of Studies). Importantly, the education kits integrate elements from the Human Society and its Environment (HSIE) History curriculum within this context. Meeting the Sun by Elena Kats-Chernin has been commissioned by the Kokoda Track Memorial Walkway to commemorate the 2015 Centenary of Anzac and to mark the 70th anniversary of the end of the Second World War. 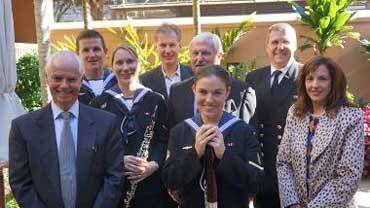 Its world premiere performance by the Royal Australian Navy Band together with the Sydney Children’s Choir—part of the Gondwana Choirs national choral network—is presented by the Kokoda Track Memorial Walkway at its Anzac Dawn Service on 19 April 2015. The commissioning and performance of Meeting the Sun is the central component of the Kokoda Track Memorial Walkway’s Anzac Notes project, which was instigated in 2012 to honour and remember Gallipoli, Kokoda and 100 years of Australian service. Meeting the Sun is an eighteen-minute long work that consists of five movements. The first movement, I Wish I Was Young, features a poem written by Carl Wilbur Baker (c1889-1967) who was an Australian veteran of the First World War and the Second World War. It tells of the exhaustion and weariness felt by a young soldier as he contemplates his 22nd birthday. The experiences of war have weighed heavily upon him and he has aged beyond his years. He laments his lost youth, wishing that he could be ‘too young to care’. The second movement, the instrumental Hearts on Fire, features clashing tonalities and strong dissonance as a way of imagining the fear, terror and conditions experienced during war. The third movement, This Lovely Day, sets to music a poem composed by Robert Oswald Ball (1914-2003) in 1943 while he was serving in New Guinea during Australia’s Pacific campaign. Sergeant Ball’s personal expression of longing and loyalty for loved ones far away in the midst of the daily uncertainties caused by war has a universal and timeless resonance. The fourth movement, Wipe Away Your Tears, draws from Atatürk’s tribute to the Anzacs. Penned in 1934, his expression of reconciliation offered consolation to mothers whose Anzac sons lay at rest in Turkish soil. Lest We Forget is the final movement and while mostly instrumental, it features children’s voices towards the end as a symbol of hope and endurance before finishing with fragments of the timeless Last Post. In commissioning Ms Kats-Chernin to write for children’s choir, the Kokoda Track Memorial Walkway sought to encapsulate and communicate concepts of hope, freedom, grace, reflection and future—that the sacrifices made by men and women who have served over the past one hundred years has enabled the Australian community—past, present and future—to live in freedom and hope. The inclusion of young men’s voices brings an added and poignant dimension to this. By including a military band in the music commission brief, the Kokoda Track Memorial Walkway wanted to recognise and build on the role that military bands and musicians have had and continue to play in military traditions and in community commemorative events. Launch of ANZAC Notes at the Speaker’s Garden Parliament House, Sydney. 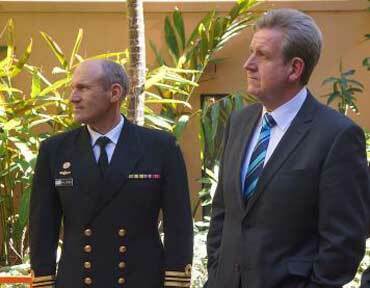 On Tuesday 21st May 2013 in the Speaker’s Garden of the NSW Parliament, the Premier of NSW, the Hon. Barry O’Farrell MP, officially launched Anzac Notes, a unique music project initiated by the KTMW to honour all those who have served our nation in times of war during the past century. Ms Penny Stannard who is the Curator and Executive Producer for the project, spoke of her involvement in facilitating the creation of a versatile composition for concert band and choir. In advancing the Project, Ms Stannard has forged pivotal associations with the Australian Music Unit of ABC Classic FM, the Royal Australian Navy Band, the Gondwana Choirs and the Association of NSW Regional Conservatoriums. Composing a musical work that best reflects the spirit of those who have served Australia in many wars, and of the 100,000 plus who paid the supreme sacrifice for a relatively new nation, is a monumental task. Elena Kats–Chernin, a composer with considerable experience in creating works to commemorate special events, has been chosen to realize this commission.